Upt to this point, fusion research has focused on the realization of hot and dense plasma required for a fusion reactor, as symbolized in the achievement of the world record ion temperature of 520 million degrees C in JT-60U (Fig. 1). Japan is participating in construction of ITER, fully incorporating knowledge and experience developed through the construction and operation of JT-60U. 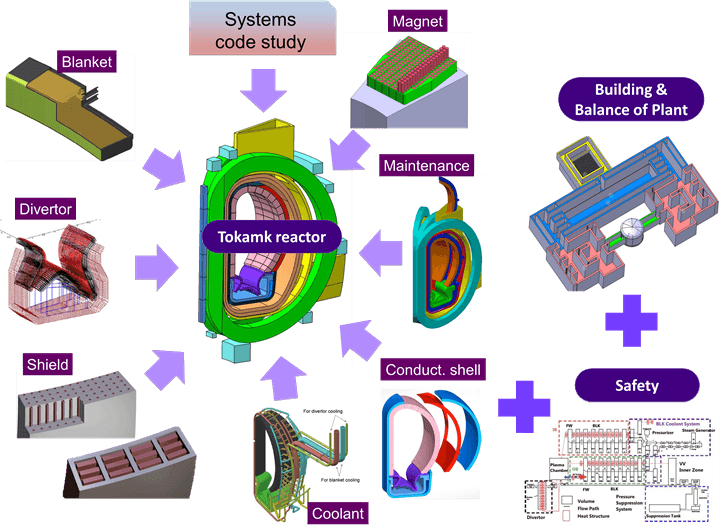 ITER will burn fusion fuels for periods lasting several minutes. However, electricity will not be generated in ITER yet. The DEMO reactor (DEMO), the next phase of ITER, will produce electricity via fusion reaction at a steady rate. DEMO will also breed tritium, a fusion fuel which does not exist in nature. 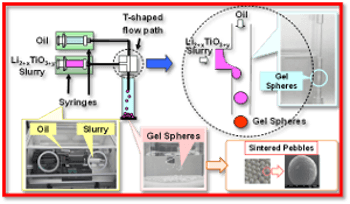 Consequently, DEMO will need the technology that enables the generation of electricity from fusion reaction and the breeding of fusion fuel. Blankets surrounding the core plasma play the key role in electricity generation and fuel breeding (Fig. 1). 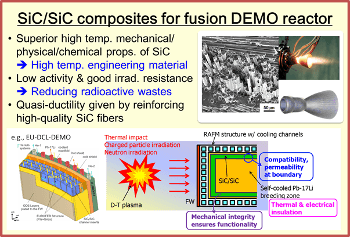 Successful DEMO construction and operation will bring fusion power at close hand to commercialization (Fig. 2). 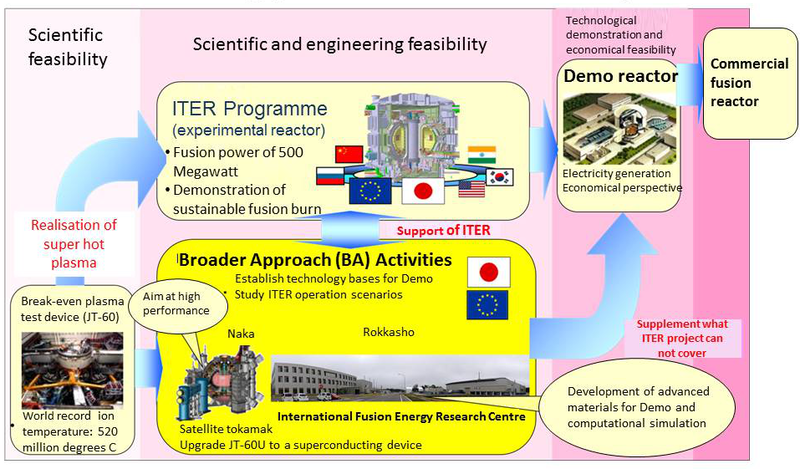 International Fusion Energy Research Centre (IFERC) carries out DEMO Design Activity and Research and Development of blanket materials under cooperation between Japan and Europe. Also IFERC operates Computational Simulation Centre (CSC), which has a high performance computer enabling efficient computation at a large scale, and prepares for ITER Remote Experimentation Centre (REC), which allows scientists in Rokkasho to participate in experiments in ITER, being constructed in France. DEMO reactor will produce electricity at last and also breed a fusion fuel (tritium) not existing in nature. 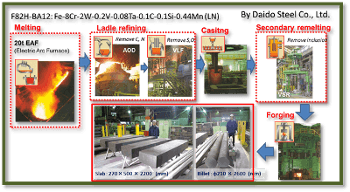 Each reactor component design is being accomplished, combining the best technology from Europe and Japan. Technical meetings are held regularly between Europe and Japan for information exchange and in-depth discussion of common issues. 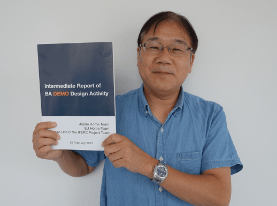 The Intermediate Design Report has been completed through collaboration between Europe and Japan. 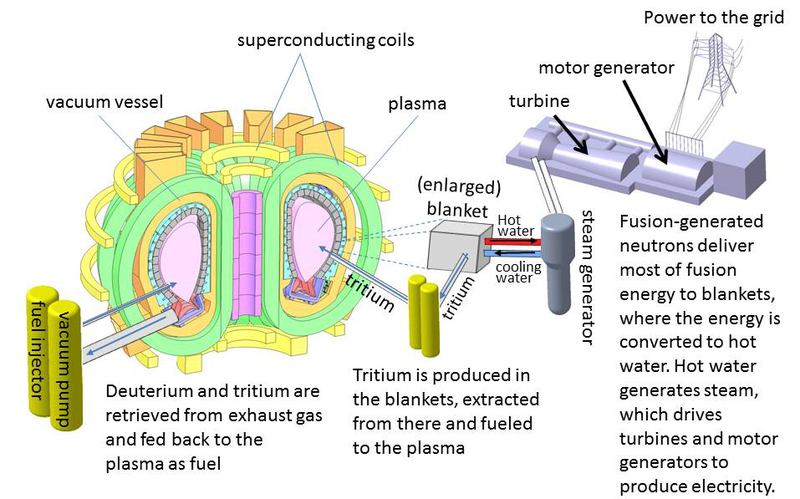 Research is being carried out to develop materials for breeding a fusion fuel (tritium) not available in nature, construction materials withstanding harsh conditions in a reactor and tritium handling technology. The prominent laboratory in Rokkasho is used for the analysis of tiles and dust from JET (Joint European Torus, Great Britain, and Europe). A high performance supercomputer (Bull, France, 1.5 Pflops) enables efficient computation on a large scale. Fusion scientists and engineers of Europe and Japan are making remarkable contributions in fusion science and technology and in reactor design, sharing the computational time half-and-half. 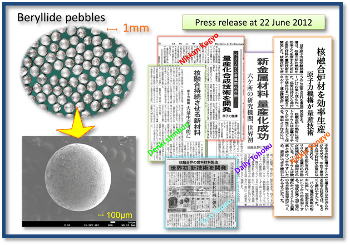 High speed internet will allow scientists in Rokkasho to participate in experiments in ITER, being constructed in France. Copyright@ National Institutes for Quantum and Radiological Science and Technology All Rights Reserved.